Many companies believe that by combining their medical devices or drug-delivery systems with connected capabilities, they can boost patient compliance and learn more about the products they have on the market. But developing a connected drug-delivery system comes with a unique set of challenges*. One of those challenges is incorporating Human Factors into the development process for connected drug delivery systems to achieve both commercial goals and meet regulatory requirements. At the interactive workshop during SMi’s Pre-Filled Syringes East Coast Conference representatives of CAMBRIDGE CONSULTANTS, Melanie Turieo, Director, Human Factors Engineering and Karen Unterman, Group Leader, Human Factors Engineering will help you to identify the considerations that need to be addressed when designing a comprehensive Human Factors engineering process for a system which contains both physical and digital elements. The workshop will take place on April 10th at the Sheraton Boston Hotel. And many more PFS experts! – Exhibition spaces are selling fast, don’t miss the chance to raise your profile – get in touch with Alia Malick on +44 (0)20 7827 6168 to discuss how! For additional details, please do not hesitate to contact us. 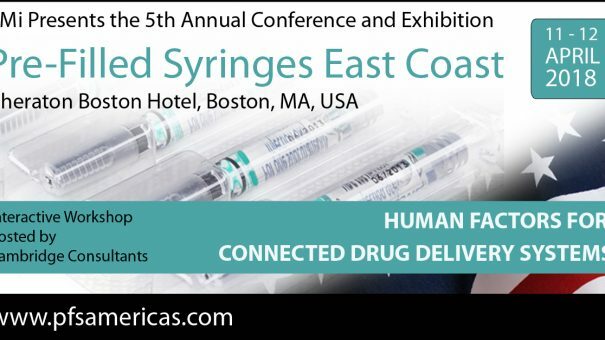 “The conference (Pre-Filled Syringes Europe) was very well organized and I want to thank you and your colleagues for the great job you did! The speeches, and also, the panel discussions were attractive.